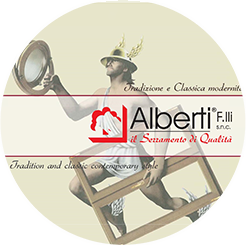 For 50 years the ALBERTI FRATELLI company has manufactured door and window frames seeking to renovate and grow over time. Today, we are proud to say that we entirely produce, throughout our workshop, innovative and unique technical window and door frames. They are manufactured using different varieties of solid or laminar wood since we aim to supply a product that combines functionality and visual appeal. Great care is taken to ensure that the highest standard of manufacturing goes hand in hand with attention to styling to suit any interior design style as well as our customers' needs and tastes. Our aim is to improve the aesthetic, architectural and living quality of residential and commercial buildings, focusing on the specific demands of our customers. Our team includes skilled technicians who are able to find customized solutions as far as materials research, colouring and architectural development are concerned. Our company has always been committed to complying with the latest regulations in order to launch only products in accordance with the highest quality standards coupled with an environment-friendly manufacturing process. .
A proof of that is the exclusive use of wood we source from origin producers in controlled forest areas and the constant attention to safety in the workplace. Choosing a frame for your house is an important, long-term investment, since replacing windows is not as simple as repainting a wall or changing some pieces of furniture. That is why it is essential to choose high-quality windows that ensure an up-to-date style and good energy-saving performance in the years to come. Quality, comfort, style and technology are our strength. All the products, made by ALBERTI FRATELLI, are CE marked and certified in accordance with the UNI EN 14351-1 and UNI EN 13659 standards, as required by the European Directive 89/106/CE. Thanks to a 50-year experience in this field, investments in new technologies and a constant search for high quality materials, ALBERTI FRATELLI is a reliable partner for the design and production of window and door frames. With its production entirely based in Italy, our company has specialized in the manufacturing of custom-made wood frames in order to supply unique and innovative products featuring a classic or a contemporary design style. Our door and window frames are produced using different varieties of either solid or laminated wood, in order to combine both functionality and aesthetic appeal to fit in with any home interiors. Among our products, laminated wood frames stand out for their durability and quality over time. Thermal and sound insulation are ensured by means of a double seal designed for a better energy saving. The finishing process, based on water-soluble products, ensures a longer life and an easy maintenance over time.